Anthony Armstrong (Consultant), Larry Brooks (Board President), Nancy Smith (ED) and Jajean Rose-Burney (Deputy ED). Photo courtesy of BlueCross BlueShield of WNY. On Nov. 7, BlueCross BlueShield of Western New York President and CEO Dave Anderson announced support for Buffalo’s exciting urban rail trail project on the DL&W corridor through the Blue Fund. The Western New York Land Conservancy will receive just over $245,000 to take this project to the next level. This linear park will be a ribbon of green that runs through the Old First Ward, Valley and Perry neighborhoods, connecting City of Buffalo youth and families to downtown and the waterfront, and to the health benefits of spending time in nature. The Land Conservancy will work with local partners who have expertise in environmental education and nature programming to increase community-centered activities, participation in nature and in the development of the trail. Partners in this project include Buffalo Audubon, Buffalo Niagara Waterkeeper, Groundwork Buffalo, the Old First Ward Community Association and the Valley Community Association. This grant will allow additional partnerships and connections to be developed. Blue Fund’s support will also allow the Land Conservancy to hire Anthony Armstrong, of Make Communities, to be the DL&W project manager. Anthony has more than 15 years of community development experience in Western New York and has worked as the consultant for the community vision plan for the DL&W corridor. “The new trail and linear park on the former DL&W rail corridor will support enhanced health outcomes for our community by expanding access to the physical and mental health benefits of immersion in nature, walking and biking,” said Michael Ball, Director of Blue Fund. For more than a year, the Land Conservancy has been leading a community engagement process to spark conversation about the future of this corridor. Hundreds have participated, including neighborhood residents, business owners and community leaders. A vision is emerging with the goal of creating a mile-and-a-half long trail system for walking and biking that celebrates our industrial and railroad heritage; creating a place that connects people with nature and people with people. The next big step for the DL&W project will invite design professionals from around the world to submit their ideas for the corridor to the Land Conservancy and a carefully selected jury of community leaders and design professionals. The Land Conservancy has retained Kishore Varanasi, an award-winning urban designer, strategist, innovator, teacher and writer, to advise the organization during the design ideas competition. Kishore is the Director of Urban Design at CBT in Boston, MA, and his work has shaped countless cities and communities around the country and the world. In addition to the Blue Fund, the design ideas competition is possible thanks to generous funding from M&T Bank, the Ralph C. Wilson, Jr. Legacy Fund at the Community Foundation for Greater Buffalo, NYS Conservation Partnership Program, the Rails-to-Trails Conservancy through the Doppelt Family Trail Development Fund, and contributions from individual Land Conservancy members. If you are interested in learning more about the DL&W project or the Western New York Land Conservancy, please reach out at (716) 687-1225 or info@wnylc.org. You can also support the Land Conservancy’s work by making an online donation at wnylc.org or by sending a check to P.O. Box 471, East Aurora, NY 14052. BlueCross BlueShield of Western New York is a division of HealthNow New York Inc., an independent licensee of the Blue Cross and Blue Shield Association. Since 1936, BlueCross BlueShield has helped millions of people lead healthier lives. BlueCross BlueShield offers a full range of insured, self-insured, and government programs and services covering businesses, families, and individuals, as well as dental and vision plans and stop-loss coverage. As a community-based, not-for-profit health plan, BlueCross BlueShield contributes significantly to organizations that strengthen and enrich the health of our community. For up-to-date news, facts, and information about the company, leadership and industry, please visit the BlueCross BlueShield News Center at bcbswny.com/news or follow them on Twitter. Blue Fund, funded solely by BlueCross BlueShield of Western New York, awards major grants in Western New York, totaling approximately $1 million to $3 million annually, to organizations and initiatives that have a positive impact on key health areas and will demonstrate enhanced measurable outcomes for community health metrics. These include behavioral health, cardiovascular health, diabetes, health care workforce development, healthy children and the opioid epidemic. Blue Fund complements BlueCross BlueShield’s current corporate giving program of partnerships and sponsorships which saw community investments of more than $2 million in Western New York in 2017. 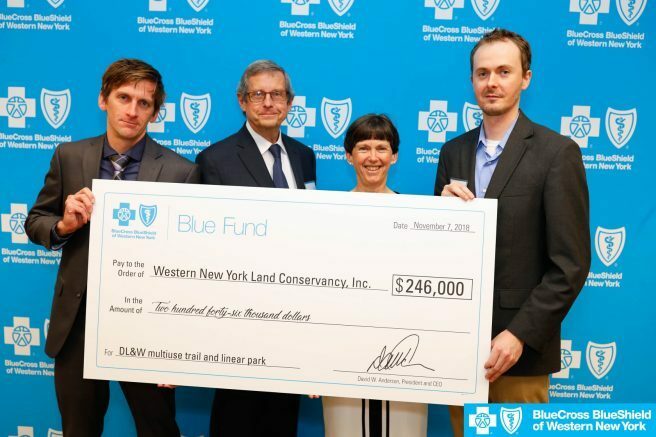 Be the first to comment on "Blue Fund backs Buffalo’s DL&W Trail & Park"